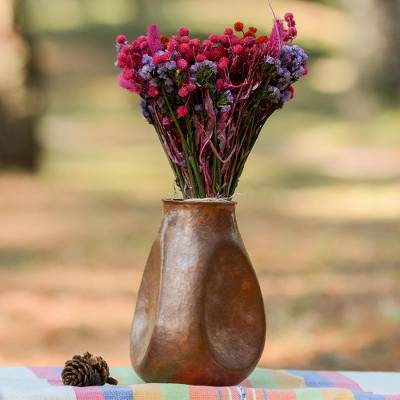 Working in copper, Mexican artisans Rosy and Daniel create an impressive vase that will add a modern touch to your home decor. To create the vase's form, the artisans heat the copper to a red-hot temperature and diligently strike it with a hammer to craft it into the desired shape. This intensive process takes between three and six artisans to complete. Once crafted, the vase is given an antiqued finish that highlights each individual hammer stroke. The round vase is detailed with three egg-shaped impressions around its exterior. This home accessory is perfect for simple decor or for displaying flowers.